Greek peas are phenomenal and hands down our absolute favorite way to enjoy peas. They’re perfection right off the stove and even a bit better than that a day or two later! This dish is infinitely scalable and very easy to reheat. In Greece a big bowl of arakas kokinistos is often enjoyed as a meal in itself and Greek peas are also an amazing side dish to just about anything you can think of. Fresh dill is key to making this dish the standout it is. 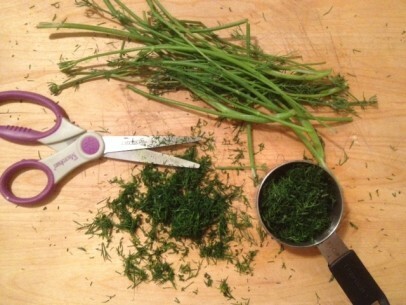 I like to use my kitchen scissors to cut dill into very fine pieces. Remember to measure your amount of dill AFTER it’s been chopped. When available, always use fresh peas. Shucking them is one of the joys of summer vegetables. Most of the year though I use frozen. Make sure to use good quality, preferably organic, frozen peas. I would not recommend using canned peas. They just don’t work well and often break down into mush as the dish cooks. Make sure to thaw peas completely before adding to the pot. Most times, I spread out the frozen peas on a thick dishtowel on the counter and roll my hand of them a few times and they’re thawed in about 30 minutes. Just a few simple ingredients make this the most delicious sauce imaginable. Tomato paste, onions, dill, salt, pepper and oregano – your peas will be swimming in amazing! You have the option to use less tomato paste depending on how much tomatoey taste you like. I usually go with a 1/3 cup but have alternately gone with both a full 1/2 cup for super tomato flavor and also a 1/4 cup for a very light sauce with equally good results. Try to chop your onions finely. They should almost melt into the finished sauce. Onions are on their own here, no garlic, so be sure to be generous and I prefer to use sweet white onions but have successfully substituted red onions on occasion. When adding your spices and fresh dill to the sautéed onions, heat on low for only 3-4 minutes. You want to just release the oils and aromas without cooking these ingredients to death. Mix everything well to combine completely. This is the base of your dish so make sure not to skip this step! Stir your fresh or thawed peas into the herbs and spices and cook on low for about another 3-4 minutes . Once you add the tomato paste dissolved in water and the additional 2 cups of water, bring everything up to a boil. Let the pan boil for about 3 minutes or so and lower heat way down. Then just cover pan and cook on low heat for 40 minutes – you’re done, its that easy! Gently sauté chopped onion in olive oil over low heat until almost translucent. 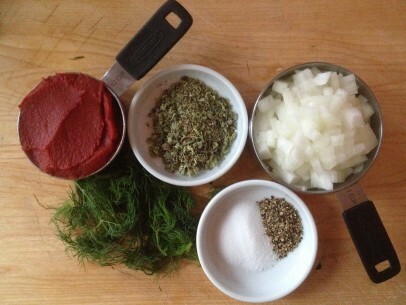 Add salt, fresh ground pepper, crushed Greek oregano and fresh chopped dill to onions. Stir to incorporate completely and cook on low heat for 3-4 minutes. 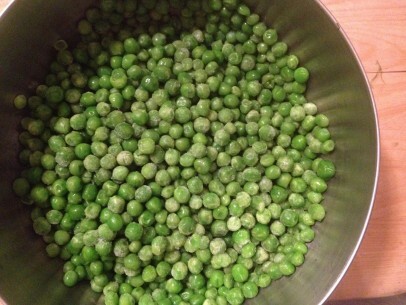 Add fresh or thawed peas, stir well and cook for 3-4 minutes. Add tomato paste dissolved in 2 cups of water with additional 2 cups of water and mix well. Raise heat to high and bring up to a boil. This may take about 5 minutes. Allow pan to boil for about 3 minutes. Reduce heat to low and cook , covered, for 40 minutes. Serve immediately or let cool and refrigerate, covered, for up to 5 days. 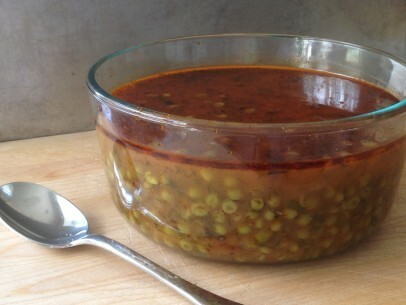 When reheating, add 2 tablespoons of water for every cup of peas and reheat, covered, on low. This recipe makes approx 4 1/2 cups and can be easily scaled to make larger amounts. I’m so glad to have found your site! 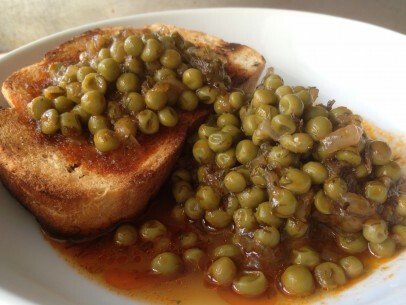 Couldn’t agree more that this recipe for peas is absolutely delicious. While I’m not technically vegan, I eat vegan on a regular basis thanks to delicious recipes like this one. Looking forward to reading more! This was so delicious! I devoured the first batch and I’m cooking up a second batch right now. Your recipes are some of the very best I’ve seen. I’m so glad I found you. Do you have a cookbook to purchase? Thank you so much for your authentic Greek recipes that are vegan. 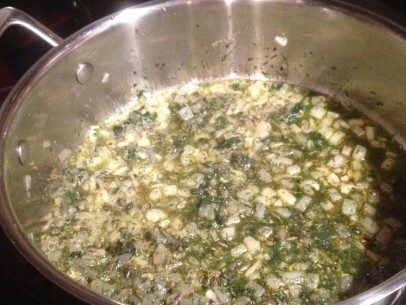 1) Split the dill into two parts, add one before the long simmer, then add the other half for the last two minutes. The combination of fresh/cooked dill is great. 2) Squeeze about 1/2 a lemon’s worth of juice at the end. The brightness will pop the dill and tomato flavor. I just came home from food shopping and decided to check my computer for new messages. Funny that there should be comments about your “Greek Peas” recipe. I went to shop mainly for the ingredients in that very recipe! The Greek Vegan is one of my favorite sites. Thank you. ps – check out Rich’s comment here as well, great ideas for this dish! My husband is Greek and vegetarian, so happy to have found your site for all the recipes to cook him. Will try this one, he will love it! i just finished making this for the 1st time. EXCELLENT!! I managed to survive the fast of Great Lent using your website & NISTEIA magazine. It also made me the cooking star of Pre-Sanctified Liturgy dinners which, given what wonderful cooks go to my church, is quite a feat! Thank you! Thank you! I have to say that we are not vegans, but love your recipes. During fast and after we regularly use these recipes. No one ever expects the Milo Pita to be vegan. The peas I add carrots n zucchini (sometimes potato). Thank you from this Xenos! I made these tonight for dinner — delicious! I thought they needed a bit more salt so I added more, and they were perfect. I am half greek and my husband is fully greek, and both of us loved them. So glad I found your blog! I made these to accompany a traditionally meaty Jewish holiday dinner recently, along with your mushroom stifado (served as an appetizer) and gigantes plaki. 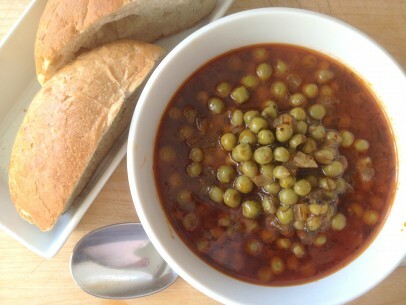 I doubled the pea recipe, hoping to have plenty leftover for myself; wrong! The only thing that didn’t work for me was the volume of liquid when scaling up; if I counted correctly, doubling would call for a whopping eight cups of water. I reduced by a couple cups to start but that still left me straining and discarding in the end! Still the peas were “swimming” and delicious. Big hit; thank you. Had this at my cousins last night. Sooo yummy. I grew up in Greece – we always made this with potatoes or carrots as well. And loooooooots of olive oil! I’ve never thawed the peas first so will try that next time.